»Why The Charming Poonjar In Kerala Demands Exploration? Why The Charming Poonjar In Kerala Demands Exploration? If there is any state in India where you spend your vacation amidst the serenity of nature, then it is certainly the God's Own Country, Kerala. After all, it is also one of the few states where you can savour the beauty of backwaters, hills, valleys, waterfalls, beaches and lakes. But if you are tired of visiting over explored places in Kerala, then you must consider planning a visit to the charming town of Poonjar. Nestled wonderfully amidst a vast expanse of greenery, this untold beauty has everything that can make your vacation unforgettable and worth remembering. Wouldn't you love to find yourself at such places? If yes, then read on to know more about the location and surroundings of Poonjar in Kerala and why you should explore it. Poonjar is a year-round destination and hence, it can be visited anytime during the year on account of its pleasant weather and luxuriant surroundings. However, if you desire to skip the summers of Kerala, then the best time to visit Poonjar is from September until the end of March. During the period, the beauty of this least-explored hill station is at its peak. 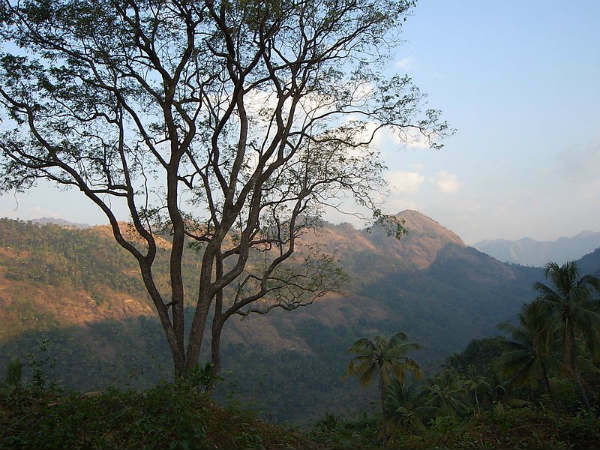 Poonjar is located in the Kottayam district of Kerala in the foothills of the Western Ghats and is popular amongst locals as a historic site. However, over a period of time, it has gained popularity amongst offbeat travellers for its scenic beauty. As per historical records, Poonjar has been in existence since the 12th century when it was ruled by the Poonjar dynasty, the descendant of the Pandya kings. Therefore, you can find numerous historical sites, such as temples and palaces, within its boundaries today. Isn't it a wonderful place with natural beauty and historical marvels? If you have been looking for such peaceful and uncrowded places, then you shouldn't be late in planning a trip to Poonjar. The major reason why you must plan a trip to Poonjar lies in its composed and peaceful environment which will certainly help you to rejuvenate your mind and soul. Apart from scaling the hills and fathoming the beauty of forests, you can also indulge in exploring its history and visit its historical places. Meenchil river which flows in the vicinity of Poonjar is also a spot of tourist interest. So, when you are getting such an amazing amalgamation of hills, valleys, rivers, temples, churches and palaces, why not get yourself to Poonjar? By Air: The nearest airport from Poonjar is located in Kochi at a distance of about 87 km. Once you have reached the airport, you can hire a direct cab to Poonjar. It will take you an approximate time of 2 h 30 min to reach your destination. You can also go for a bus from Kochi to Kottayam and then from there, take a cab to Poonjar. By Rail: The best way to reach Poonjar by rail is to take a direct train to Kottayam railway station and then from there, a cab to Poonjar. The distance between Kottayam and Poonjar is 44 km. By Road: Poonjar is easily accessible by road as it maintains a good system of roads. Poonjar is located at a distance of about 165 km from the capital city, Trivandrum.